In the national high performance centre for “Chemical and Biosystems Technology” in Saxony-Anhalt, the optimisation of technical process chains in the plastics processing, chemicals, biotechnology and biomedical industries takes centre stage. Here, the Fraunhofer Institute, the Martin Luther University of Halle-Wittenberg, the federal state of Saxony-Anhalt and industrial companies are researching and developing new materials, products and processes. Right now, four project groups with 21 individual projects and ten community projects are being supported by partners of research and industry. It is in Saxony-Anhalt – a German state in which the chemicals industry and its distinctive research orientation traditionally play a key role – that researchers of the Fraunhofer Association are currently developing a polymer composite material that has a biocidal effect, i.e. one which has a growth-inhibiting effect on germs and is fire-retardant at the same time. Its biocidal effect against algae, fungi and bacteria has been achieved by the scientists by adding a variety of naturally-based additives. It is conceivable that the material will find use in wall panels or door handles in hospitals. The starting basis for the material is an environmentally-friendly biogenic resin system which is based on epoxides derived from linseed oil or other plant oils, rather than on the conventionally used petroleum-based raw materials. Material systems of this kind represent an intermediate step in the manufacturing of plastics. Tissue or scrims from different fibres are bonded together in them and subsequently harden. The improvement of organically-based resin systems is one of the research projects to be funded by the high performance centre for “Chemical and Biosystems Technology Halle-Leipzig.” This network, which supports research and innovation in the Halle/Leipzig region, has existed since 2016. The Fraunhofer Institute, the Martin Luther University of Halle-Wittenberg, the oldest university in Saxony-Anhalt, as well as numerous industrial companies have all joined forces in the network. With an advisory board member, the Investment and Marketing Corporation of Saxony-Anhalt is also supporting the networking within the scope of this top-level research project. The high performance centre is jointly supported by the federal states of Saxony-Anhalt and Saxony, the Fraunhofer Association and regional industrial partners. The federal states, the Fraunhofer Association and the participating companies are currently aiming to make some 13 million Euros available in start-up funding over a three-year period. “We want to further raise the profile of the Central Germany chemicals region with industry-proximate research and development projects so as to establish modern, sustainable raw materials as a future prospect for industry in the region,” explains Professor Andreas Heilmann, spokesman of the high performance centre. Professor Heilmann is director of the business unit for biological and macro-molecular materials at the Fraunhofer Institute for Microstructure of Materials and Systems (IMWS) in Halle, the largest city in the federal state of Saxony-Anhalt. Five Fraunhofer centres in the region have already implemented the concept. The goal of the cooperation is to work together at the regional level on the creation of a closed value-added chain that starts with the renewable or fossil raw material, and finishes with the end-product. Germany is home to 16 such high performance centres which have been initiated by the Fraunhofer Association. The high performance centre for “Chemical and Biosystems Technology” is the only centre, however, which focuses on the research and optimisation of technical process chains for the plastics processing, chemical, biotechnology and biomedical industries. With the region of Halle-Leipzig, a region which is particularly strong in the fields of both industry and research has been chosen for the support. In the longstanding, tradition-rich Central German chemicals region, an industrial cluster of some 750 companies with an annual turnover of more than 20 billion Euros and over 70,000 employees has developed. There are closed material flows in the chemicals parks to which the region is home, and there are also sophisticated regional value-added chains with products that are marketed and sold worldwide. 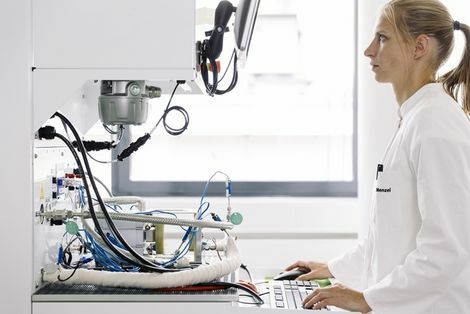 “The industrial regions of Germany can only remain competitive over the long term, however, if their considerable potential in basic research and applied research is combined together more closely. In this respect, it is especially important to establish regional research and cooperation networks between the fields of basic research, application-oriented research and industrial development," highlights Professor Andreas Heilmann. All of the research projects under the aegis of the high performance centre are realised as collaborative projects between the companies and the research facilities, or as interdisciplinary preliminary projects by research groups from a variety of scientific disciplines. Since the end of the first successful project year, the high performance centre for "Chemical and Biosystems Technology" has been consisting of four project groups with 21 individual projects and ten joint projects between research partners and industrial partners. “This number is all set to increase. Additional research and development projects are currently in the ideas and start-up phase,” explains Andreas Krombholz. Krombholz, a physicist, is the director of the group for natural substance composites at the Fraunhofer Institute for Microstructure of Materials and Systems (IMWS) in Halle, and is also the project manager at the high performance centre for “Chemical and Biosystems Technology”. The key criterion for a project to gain the support of the high performance centre is its potential at a practical level. Some 30 companies from Saxony-Anhalt are currently partaking in one of the research and development projects. In several joint projects, the participating partners are researching materials for lightweight structures based on thermoplastics for example, a development in which the automotive industry is particularly interested. In this context, materials are being developed using natural fibres which are better and lighter in weight than glass-fibre-reinforced materials, and can also be manufactured in high unit volumes at lower cost. Zeitz Chemical and Industry Park is one of the biggest industry parks in Saxony-Anhalt. It rose from the remnants of a former hydrogenation works in 1996. It is operated by Infra-Zeitz Servicegesellschaft mbH. We met with its Managing Director, Arvid Friebe, and dis-cussed the concept behind the park, its success, and the challenges for the future. Arvid Friebe is also the spokesman of the CeChemNet Association, the Central European Chemi-cal Network.